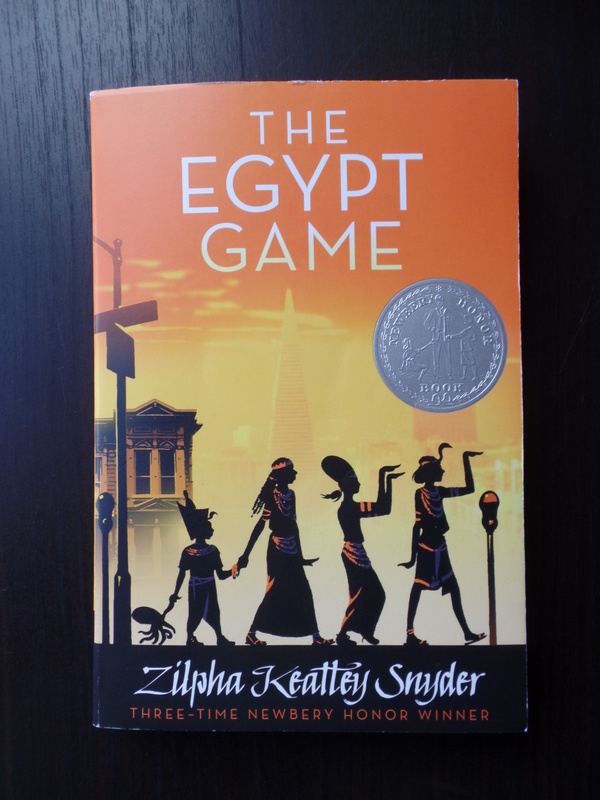 Danger and Diversity: The Egypt Game – The Bookshelf of Emily J. A year or so ago, my awesome sister Afton gave my oldest daughter some books for her birthday. One of them was a copy of The Egypt Game (1967) by Zilpha Keatley Snyder. As Olivia opened this present, all of us watching oohed and ahhed about the book, remembering how much we had enjoyed it as children. We also exclaimed over the other book, The Mixed Up Files of Mrs. Basil E. Frankweiler, which I have already posted about reading with my daughter. However, as the months went by, I noticed that Olivia had not read these books. She hadn’t even cracked them open. I’m not sure why, but she resisted any attempt at me urging her to read them, promising that they were good ones. So, I decided to read them to her. We just finished reading The Egypt Game, and I realized that I had forgotten most of it. I remembered that it had something to do with children playing in a vacant lot as if they were in ancient Egypt, and that they gathered “treasures” for this game, but I did not remember any of the details or the larger plot. It was delightful to revisit this one with my daughter. She enjoyed it too. The larger plot presents some of the dangers of childhood. Some scholars have claimed that these dangers are overstated, in order to put more pressure on parents (mothers in particular) to constantly watch over their children. Such perceived danger is also a result of media coverage of rare incidents involving children, and has contributed to helicopter parenting. However, this book was written before all of that, and seems to work in a subtle way of warning children how to be safe in their own neighborhoods, especially in large cities, and reminding children subtly of the importance of diversity. The warning to children part has to do with the large plot of a murder in the neighborhood. It is the second murder of a child in the area, and parents begin keeping their children indoors, preventing the Egypt kids from playing their game in the vacant lot behind the professor’s junk shop. The kids find ways to sneak there, even on Halloween. Toward the end of the novel, one such incident results in a dramatic attack on April, one of the children. She is saved in the nick of time because of the professor, who has noticed the children playing in his lot all along, but it is a frightening incident and seems to serve as a warning to children not to go out alone at night, even when a forgotten math book and homework is at stake. Of course, April endures the attack and lives, because a children’s book with a first-hand account of a murder would be too shocking for young readers, in my opinion. However, it is a jarring scene and one that might scare some children. However, my daughter is scared of everything right now (she’s 10 and going through some sort of fraidy-cat phase), and this book didn’t bother her. It is a pretty mild treatment of a difficult issue. As to diversity, this book brings together children from many backgrounds and ethnicities as part of the game. It starts out with April coming to live with her grandmother, because her own mother is too busy in Hollywood to care for her. We learn that April is somewhat neglected and unwanted and that her mother seems to be irresponsible and unaware of April’s needs. April acts out by wearing false eyelashes and dramatically styling her blonde hair. She’s also cold and too mature to associate with other children. However, she eventually makes friends with Melanie and Marshall, two African American children who live in her building and whose mother watches April when her grandmother is working. Melanie is April’s age (fifth grade, if I remember correctly) and Marshall is about 4. The three of them invent the Egypt game together, and eventually invite other children to join them once they make more friends at school. These kids are a younger girl in third grade named Elizabeth, a Chinese American, and two boys in fifth grade, one who is Asian and one who is Caucasian. I liked this mixture as a way of exemplifying difference and cooperation and inclusion for children. I also liked that their economic backgrounds vary widely, and we learn about these children’s parents in the narrative. Overall, this is a gripping book with mystery and danger alongside intriguing descriptions of their ancient Egyptian play, including rites and ceremonies. Such a book, while some may find it sacrilegious for children to play at ancient religion or pagan religion, seems to be a good way to promote imaginative play for kids who are so constantly tied to computer screens, video game consoles, and mobile devices with all kinds of exciting and addictive games. I like that this gave my daughter a taste of what it was like to actually play in the “olden days” and I hope to see her and the neighborhood kids exploring and playing outside with their imaginations this summer. I’d like to see them get as excited about playing a make believe game outside that is ongoing, than stare at a screen for hours and hours. Hopefully, this book inspired just that, and I’ll be sure to encourage such play. This sounds like a good one for when two of my nieces get a little older. Yes, I AM awesome, thanks for noticing. I kid. But seriously, glad you finally got Miss O to enjoy these treasures. Now that she’s done, I may have to borrow it myself! Yes, feel free to borrow. Such a fun book and so great to revisit it! This was one of my favorite books as a kid! My sister and I played elaborate games like that all the time, and I think it was definitely connected to the fact that our parents made us avid readers. What fun memories you must have from your childhood with your sister. Very very cool! Never heard of it – now intrigued! Oh this looks like a good read. Oh I am very interested in this book. Another good one that I didn’t know about – thanks, Emily! I hope you get a chance to read this one with your kids! I remember making my own Egyptian costume out of construction paper after finishing this book at age 10, so it apparently inspired me! I didn’t have this book when I was a child, but it sounds like a good one! You know, she has just begun to be less scared. I wrote this post about a month ago, and now things are getting better. Hooray! I don’t know if she would, but I should try it. I think Follett’s books are still a little grown up for her. I forgot about the “stranger danger” aspect of this book. When I read it (in the 70s), it seemed that parents were still making up there minds about letting kids play on their own. Zilpha Keatley Snyder is another one of those great authors with three names. Laura Ingalls Wilder. Louisa May Alcott. Edgar Rice Burroughs. Hans Christian Andersen. Elizabeth Barrett Browning. Arthur Conan Doyle. William Butler Yeats. John Stuart Mill. John Cougar Mellencamp. Ha! Love it. I guess you need three names to either be a great author or a serial killer? I think I heard that somewhere, but I can’t think of anybody right now. We’ll get it at the library – thanks for the tip. My 10-year-old daughter is also in the fraidy cat phase – what’s up with that? My 6-year-old is less afraid of things than she. My friends with older kids have said this phase is pretty common. The good news is that my daughter is slowly but surely pulling out of it. It lasted about 6 months, but I think we are almost done! Hang in there.